In a Democracy Now! exclusive, legendary activist and scholar Angela Davis speaks out after the Birmingham Civil Rights Institute rescinded a human rights award for her, reportedly due to her activism for Palestinian rights. In a Democracy Now! exclusive, legendary activist and scholar Angela Davis speaks out after the Birmingham Civil Rights Institute rescinded a human rights award for her, reportedly due to her activism for Palestinian rights. In September, the institute announced that it would award Davis the Fred L. Shuttlesworth Human Rights Award, named after the civil rights icon. But last Friday, the institute voted to withdraw the award and cancel this year’s gala event. The institute rescinded the award days after the Birmingham Holocaust Education Center sent a letter urging the board to reconsider honoring Davis due to her support of the Boycott, Divestment and Sanctions. Others in the Birmingham area criticized Davis for her support for the Black Panthers and Communist Party. 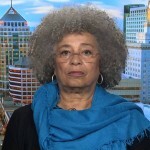 Angela Davis is interviewed – her first television interview since the controversy began. I can’t help but love Angela Davis. We’re astro-twins, born on the same day, along with Nick Mason, drummer of Pink Floyd. What a great day to be born! Having been a fan of both of my twins, I followed Angela’s progress during the ’60s with particular interest, supporting black peoples’ attempts at achieving respect and equality on this side of the pond. It seemed to me that Angela took her pride as far as it could go within the confines of love and peace which was the mantra of the day as far as I was concerned. In America, guns were the borderline; we didn’t have those in the UK, but in the USA they became the line which revolutionaries needed to cross to prove their true credentials. Angela Davis did not cross that line and I respected her decision from the centre of my soul. Happy 75th birthday, Angela. You fight on as you might not have done had you been the gun-toting revolutionary that some of your brothers wanted you to be. What can’t be taken away from you is your sincerity, your concern for truth, your basic righteousness and, above all, your unconditional support for the down-trodden in a rich society. Praise God for your presence and hallelujah for your continuing good works.